Currently, four Paradise Island buffets provide a variety dining choices for the hungry vacationer. Not surprising, the Atlantis Resort features three of the four very different buffets. 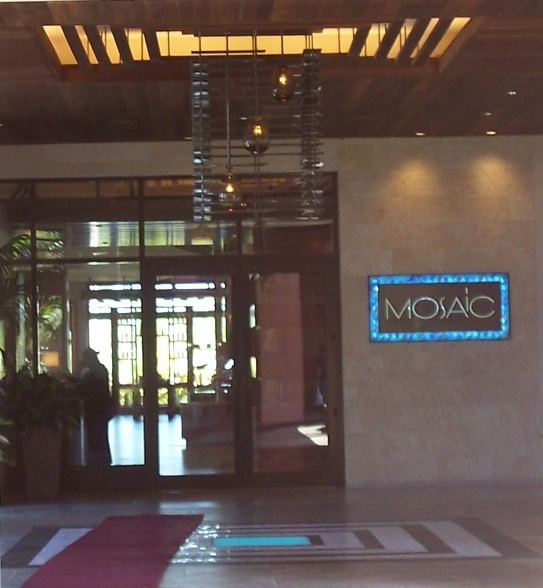 Newly opened Mosaic, in The Cove Atlantis, has quickly become the favorite buffet on Paradise Island. This chic space is centered around cooking stations where chefs prepare made-to-order dishes. Like everything at Atlantis, Mosaic is expensive; however, most people I talked to thought the food and ambiance was well worth the price. The simple decor compliments the artful array of delicious gourmet foods. You could eat here every day without getting tired of it. For example, my brother’s family eats breakfast there every day when they stay at Atlantis. The sheer size and selection at the Market Place buffet has to be experienced, particularly the dessert buffet. The Water’s Edge seafood buffet boasts an enchanting location on one of Atlantis lagoons and the same high prices ($52.90) as the other buffets. Be aware that lobster tails are limited to one per guest, so enjoy the one that you get or share with your dining companions.